This limited express “Haruka” takes you from the airport to Kyoto Station in approximately 80 minutes. 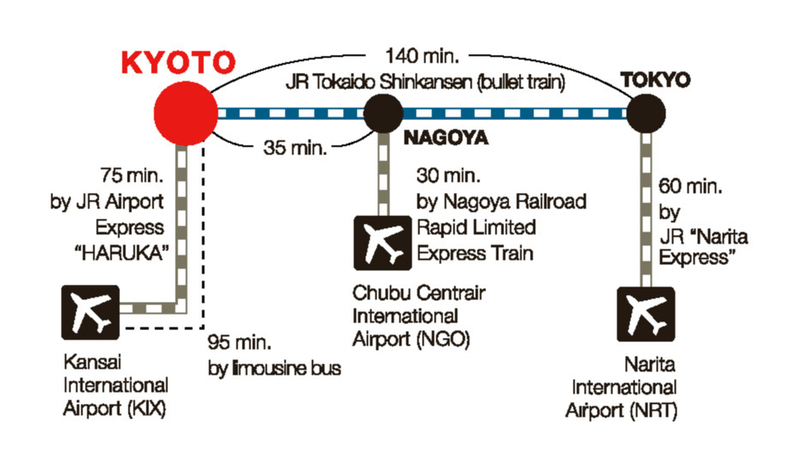 This bus takes you from the airport to Kyoto Station in approximately 85 minutes. Take the “Kokusai Kaikan” bound Karasuma Line Subway to “Matsugasaki” Station, and walk east for about 8 minutes. The current structure of Kyoto City, a rectangular grid system based on classical Chinese city design, was introduced in 794. 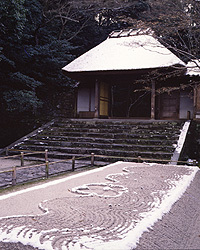 Kyoto was a capital of Japan from 794 to 1868. 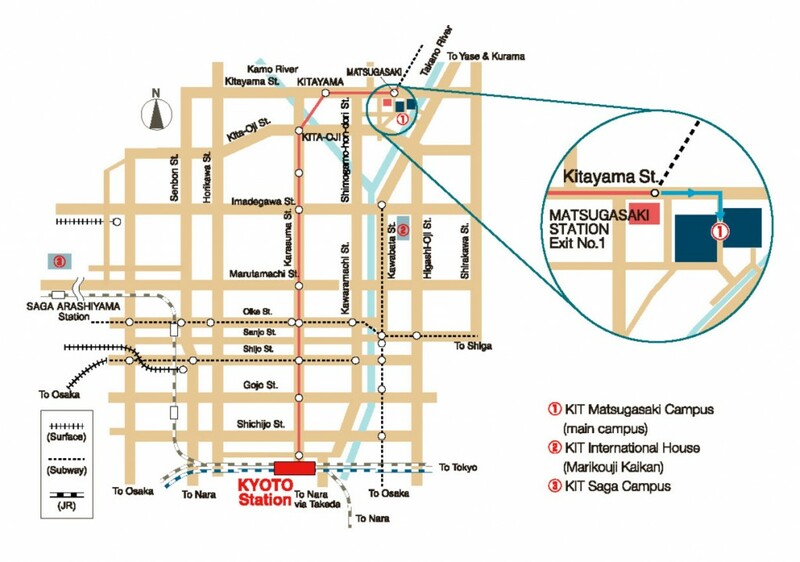 KIT is located to the east of Kawaramachi St. and Kitayama St.
Our university is located in the Rakuhoku section of northern Kyoto, which has a history of 1,200 years. Surrounded on three sides by mountains, the area is abundant in murmuring streams of pure flowing water, canals, and a rich natural environment that one would not expect to find within a major city. A short trip will take you to historic places such as Kurama Temple, Kamigamo Shrine, Shimogamo Shrine and the Shugakuin Imperial Villa. The campus is also located near Kitayama Avenue, a chic area of boutiques and clothing shops. Students have easy access to cultural facilities such as a concert hall and botanical garden. The river banks offer a beautiful view of Mt. Hiei. One might chat leisurely with friends during lunch, then stop in to visit a temple or shrine during the stroll home, indulging oneself in an atmosphere of history. In the evening, enjoy beautiful music at the concert hall. This rich lifestyle awaits students at Kyoto Institute of Technology.